In July 2018, I spent several days on the island of Kyushu in Southern Japan engaged in site visits for my research project, “Contested Representations of Industrial Infrastructure in Southwestern Japan,” sponsored by a faculty research grant as part of the Luce Foundation LIASE Initiative. This research trip served as the opening phase of a new research project that I had been conceptualizing, but not yet had the opportunity to begin executing, as my next full-scale book manuscript project. The project, with the tentative working title of Writing, Aesthetics, and Infrastructure Across 20th Century Japan deals with representations of heavy infrastructure in art, literature, and the political realm in modern Japan. A series of decommissioned coal mines and iron and steel factories in Fukuoka and Yamaguchi Prefectures have increased visibility and political salience in recent years. In 2015, the Japanese government successfully lobbied UNESCO for the inclusion on the World Heritage site register as Sites of Japan’s Meiji Industrial Revolution. These sites are politically contested in that they now lie in the districts of powerful politicians belonging to Japan’s ruling Liberal Democratic Party, but in the past hosted, in some cases, both forced labor by colonial subjects and active labor movements and worker’s art and literature circles. I began my trip in Hagi, Yamaguchi Prefecture, a small seaside town known as one of the cradles of the Meiji Restoration of 1868 thanks to the school of Yoshida Shôin and hometown to many powerful families from the Chôshû domain. Inscribed as World Heritage is the Hagi Reverberatory Furnace, a failed weapons smeltery billed as proof of early modern Japan’s will to industrialize and modernize. Situated in the home district of Prime Minister Abe Shinzô, the Furnace is today a crumbling pile of bricks located behind a suburban 7-11 convenience store parking lot. Next was Kokura and Yawata, part of the industrial Kitakyushu City metropolis. Kokura was home to some of imperial Japan’s most important heavy infrastructure and weapons and ship building facilities, and was the original target for the atomic bomb dropped on Nagasaki after a diversion due to bad weather. In Kokura, I visited the Kitakyushu Literature Museum, where writers who grew up working in and around these factories developed a local literary scene with important national influence, as well as the Matsumoto Seichô Museum, devoted to Japan’s most famous author of detective fiction, including reportage delving into government scandals during the postwar Occupation Period. The nearby Yawata Industrial Steel plant was crucial to Japan’s war effort, and likewise has been recently inscribed as World Heritage. The site itself can not be accessed; a viewing platform can only be reached via a long walk past a decommissioned amusement park, a highway overpass and underpass, and a long barbed wire corridor with limited access. The few visitors who make it this far can take a “VR” tour of the steel company offices from the pre-war (and thus politically safe) period; needless to say little mention is made of the active proletarian literary movement based at the factory. The surrounding area is in a state of urban destitution after the arrival of an Aeon Mall on the old factory site killed local businesses. From Yawata, I traveled inland to southern Fukuoka Prefecture to visit the Tagawa coal fields that supplied the raw material for the aforementioned sites. 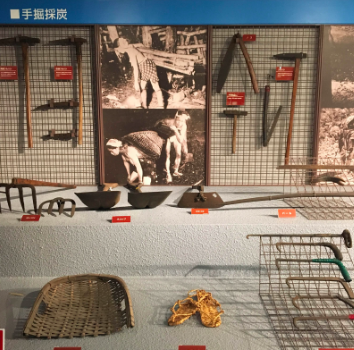 Since the closure of the mines in the 1960s and 1970s in the era of deindustrialization, the area has become defined by rural poverty and a lack of development. The region was not included in the world heritage project as a whole, but does have a presence in the culture imagination thanks to serving as a locale for a popular television drama and movie series, as well as due to the idiosyncratic reportage paintings of life in early 20th century coal mines by Yamamoto Sakubei, which are UNESCO acknowledged. Finally, I moved from Tagawa to the town of Ômuta, home of the Mitsui-Miike coal mine, several hours away. Miike was known as one of the sites of the most brutal exploitation of miners, especially conscripted and forced labor from Korea and China during the Imperial Period, and also one of the engines of industrial growth through the early postwar. It then became infamous for both one of the most deadly mining accidents and active mining labor activist movements in the late 1950s and early 1960s, and then a cause celebre for activist journalism. Mine related sites extant since and active in the Meiji period are inscribed as World Heritage, while locales related to these later phases have been razed, or thinly memorialized in a Coal Science museum sponsored by the Mitsui conglomerate which still maintains an active industrial fabrication plant in the area. 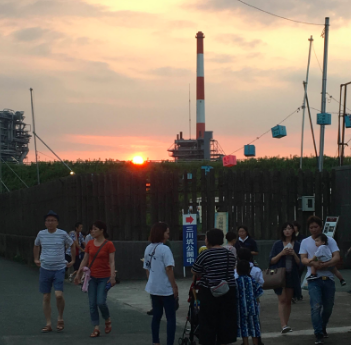 I was lucky enough to visit during the annual summer matsuri (festival) which takes place on top of reclaimed land on the site of the 1963 explosion. Taken together, this trip reinforced my sense that the recent inclusion of these mines and factories on the UNESCO World Heritage Register are deeply imbricated in political calculus; sites that do not anticipate many visitors, but the existence of which serve to legitimate and the triumphalist history of pre-war Imperial Japan while obscuring the histories of counter-narratives of unrest and struggle often located on the same or adjacent sites. The ability to conduct these on-site visits rather than read texts and histories was instrumental and crucial in my formulation of the project steps to come. I have integrated material on these sites into my class this semester on “Media and Metropolis in Modern Japan,” and intend to begin work on an article, to be later rewritten as a book chapter, on this subject in 2019.